Gundam fans who have been waiting for the series to come West should temper their expectations for Extreme VS Force — it's a clunky and uninspired mess. Bandai Namco hasn’t exactly shown a lot of love to the Gundam series in the West. In fact, outside of the occasional Warriors spinoff, the vast majority of games simply don’t make it over to our shores. I won’t pretend to be an expert on the series, but if the Japanese response is anything to go by, it appears that Mobile Suit Gundam: Extreme VS Force may not have been the strongest choice for localization. Given a digital-only release for our territories, the original version was blasted by Japanese gamers for a lack of content, terrible camera and overall shoddy presentation. Sadly, I can confirm all these things (and a few more) are true. It’s not a truly nightmarish use of the property, but even something awful might have left more of an impression than what we got — a dull, flimsy adventure that’s not nearly as fun as a game based on Gundam should be. If you’re wondering how the narrative of Mobile Suit Gundam: Extreme VS Force ties into the series, I can’t help you with that. There is a sort of “story” to experience in the form of the titular Extreme Force mode, but it seems to consist mostly of the back-and-forth banter of two anime girls whose names — to be brutally honest — I neither remember nor care about. I’d say it’s nothing personal, but when they’re going back and forth with techno-babbly lines like (and often even worse than) “It seems like the irregularity earlier has caused data from a non-U.C. world to slip through,” you’ll forgive me for tuning them out. I’m sure all the technical terms are plenty explained in the anime, but the game makes no effort to explain them to the uninitiated. Beyond that, there seem to be plenty of presumably popular characters from the franchise showing up both as protagonists and adversaries during the actual missions, but there doesn’t seem to be a real reason for them to be there outside of… well, making an obligatory appearance. Oh well. Whenever I play a game or series for the first time, one of my biggest pet peeves is being hit with a barrage of text-based explanations without a chance to actually test the instructions they’re giving me. Mobile Suit Gundam: Extreme VS Force does this pretty much constantly before you even begin your first few missions, and I have to say it — there is absolutely no way I’m going to remember all that stuff by the time I actually get into the mission. Like so many gamers (and people in general! ), I learn best by doing. Though the game is, at its heart, sort of like a Warriors title without the actual branding (you’re eliminating scads of enemies, capturing bases and issuing commands to your allies), there are a lot of little systems and mechanics that eluded me because of the poor tutorials. I then had to figure them out through a system of trial-and-error that led to a lot of unnecessary mistakes, leaving me with a poor impression before I’d even really started. That poor impression didn’t turn out to be all that inaccurate when taking the finished product as a whole, though; the complaints leveled by Japanese gamers at the original version are pretty much on point. Once I’d gotten all the rules and systems down, I had a decent amount of fun completing the first couple missions, testing out different mechs and shooting away at enemies. And then the cracks started to show. For one thing, the controls aren’t all that smooth. Sure, you’re piloting a giant robot, which naturally comes with its fair share of difficulties — but boy is it maddening to be fighting against stiff movement when the hailfire of bullets that come at you seem to require fluid and swift evasions. 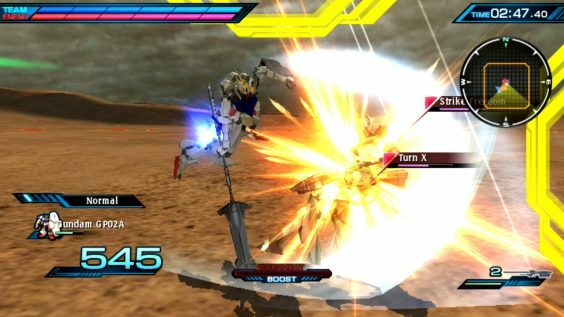 And speaking of fighting, you’ll be doing quite a lot of that with the camera if you opt-in to this Gundam game; once you’re locked on to an enemy, it rarely gives you the best view of the action, and moving the right stick just sends your perspective careening between enemies. I don’t think there’s anything terribly wrong with the core idea of the gameplay — perhaps beyond mere unoriginality — but the basics are flubbed too hard to make any of it much fun at all. 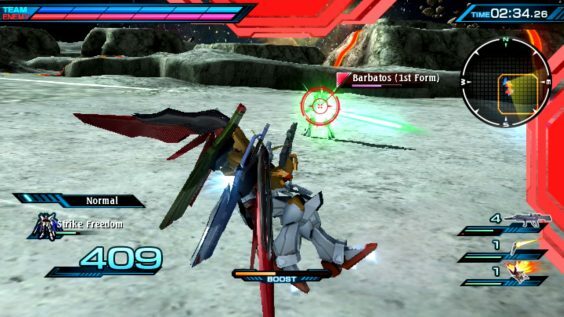 Visually, Mobile Suit Gundam: Extreme VS Force leaves a mixed impression. The mech models themselves are pretty awesome looking, boasting impressive animation and detail — especially for a portable system. On the other hand, the environments are drab and forgettable; to be sure, you spend a lot of time zooming through them on the way to the next explosion, but would it be so difficult to give us somewhere memorable to blow up our giant robots? The audio presentation isn’t anything to write home about, either; all the expected pew-pews and crashes are there, but their prevalence in the mix make whatever music is playing in the background pretty much inaudible. 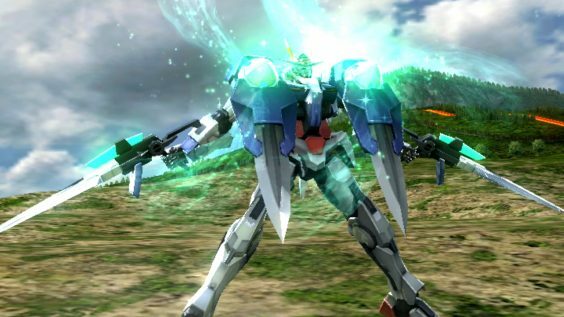 Those who have been waiting for Bandai Namco to bring a Gundam game to the West will probably find Mobile Suit Gundam: Extreme VS Force a crushing disappointment. From the Japanese response to the way it plays, all signs point to it being one of the lamest entries in the series — making it an unfortunate choice for localization. Stiff controls and an unwieldy camera can really throw off your groove during missions, and the narrative and presentation leave a lot to be desired. Hopefully this won’t spell the end for the franchise’s fortunes in on this side of the globe, but it’s not looking great given the lackluster experience Extreme VS Force provides.